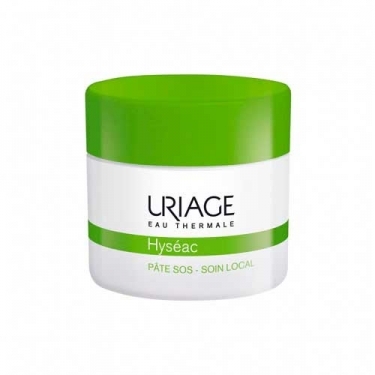 DESCRIPTION: Hyséac Pâte SOS Soin Local from Uriage is a located night care. Formulated with thermal water of Uriage, which soothes and shale extract, green clay and zinc, which act directly on the pimples, accelerates from the first night the process of eliminating imperfections. Hypoallergenic and non-comedogenic. Without perfume. 91% fast elimination of imperfection in 91% of users * * Clinical study under dermatological control. Self-assessment. Application twice daily for 7 days in 21 subjects (from 15 to 38 years). Apply at night on pimples. Leave to act during the night. Clear in the morning and check the results. If necessary, repeat the application the following night.